I've written here before about the vast improvement in high street retailers' homeware collections over the past two years or so. Marks and Spencer is another brand that continues to take their homeware offering from strength to strength. They've successfully teamed up with some notable Design Legends, namely Sir Terence Conran, which sees the introduction of bedroom and kitchen collections to the existing living and dining ranges. A good number of my top picks come from the Conran range, which has a classic, stylish simplicity to it, with more than an air of high quality - the clothes valet is made of solid walnut, for example. As well as the sophisticated Conran collection, there are three core themes, Spectrum, Chalk and Geisha, across their latest collection. 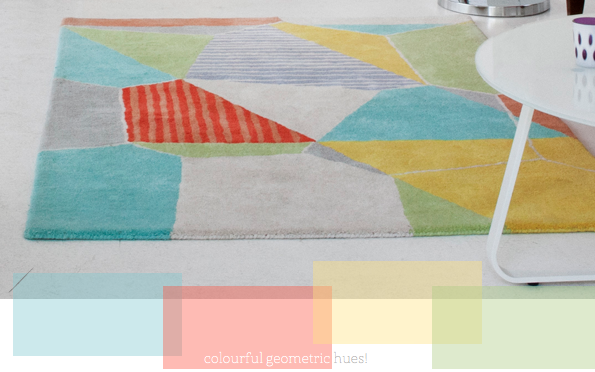 Spectrum is packed full of bright, luminous pastels and bold graphics, such as the geometric rug seen above. Chalk has a more natural and pared-back feel with the fabrics and textures reflecting organic and natural fibres. The third theme, Geisha, demonstrates lavish and vibrant colours such as deep fushia and magenta, inspired by oriental opulence. Which products are catching your eye? How would you incorporate these into your space this spring? those cushions are so cute! Wow, Marks and Sparks is lookin good! The first set of collection is just so natural. The rest all look good. Thanks for sharing! ooh how I miss M&S! I love the fact that all brands improved their home collections. And they also offer products that are really affordable! I've visited H&M yesterday and brought home some lovely pillowcases. Oh how I miss m&s!!! They have stepped it up. Love! I like the first photo, with white, light blue/turqouise and wood. 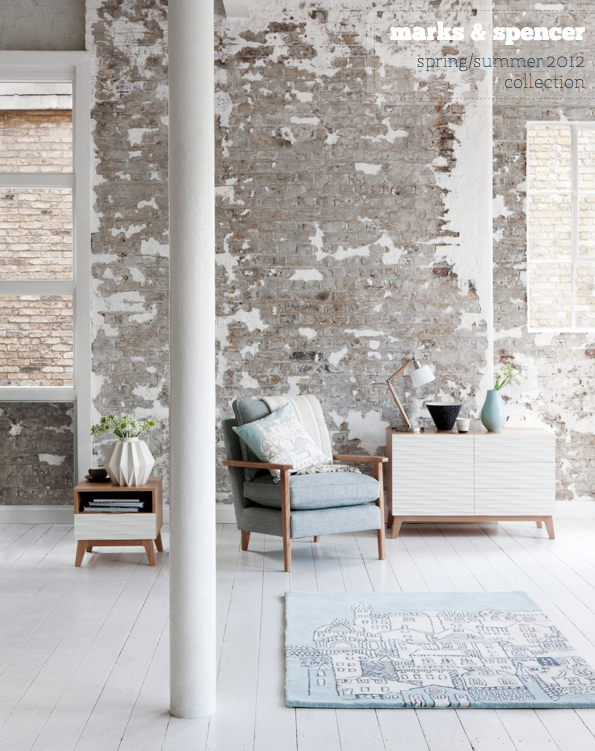 And I had to take a peek at the Conrad range in the webshop, and found a rug that would fit very well in my living room this spring/summer: the Kilim Patchwork Rug in aqua, grey and neutral tones. The sculptural vase and pendant light are calling my name! Love these! Omgosh, I am really, really, really dying over this collection! I don't think there's one thing here I would say no to! If only they would open a Marks and Spencer here, sigh! Oh, my! Their collection looks really wonderful. Love the location as well - the brick wall is awesome! I'm happily surprised that this is M+S! I love the bedding especially. Very much like that white diamond shape graphic vase (even if the flowers they have styled with it are too small!) Might have to invest! Like the graphic bedding too... and those cushions! Some good finds here - however I'm yet to have found an M&S that stocks even near the whole collection! So frustrating!! 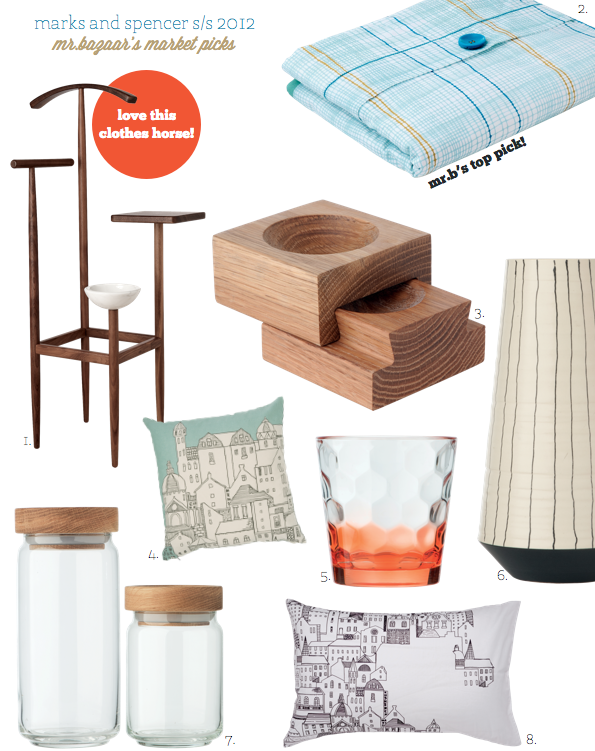 I love that walnut clothes horse ... well done M&S and thanks for sharing Will. @fox and fawn, Sarah Roads, febe, Designwali, Martine, Hannah, Anette, Marina - I know, right? So impressed with this collection. @Maria - I'm with you 100% on that point; their price points are very accessible. Then again, they should be as they have the buying power to deliver better value for consumers. @Jamie - Yes, the Chalk range does feel very fresh. @Jessie - The sculptural vase is a statement piece - I think I'd line three up in a row. @Jeanne - Let me know if you want me to send you anything over! @Rachie - I visited one of their standalone Home stores over the festive period for the first time and I was really impressed. Totally changed my opinion of their offering. Not sure if there is one near you? Grey tones and light wood... It's dreamy!! Love the texture of the brick. Would love it for the facade of my home. good find on those jars! love them. 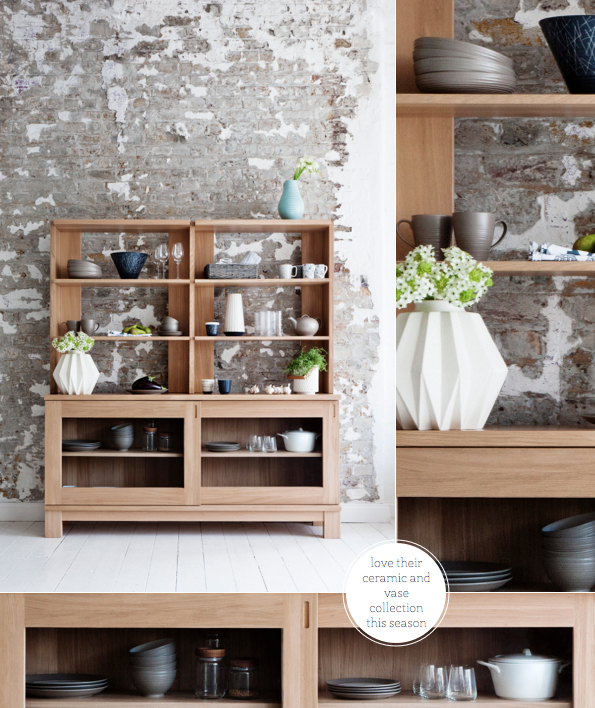 Phenomenal home collection, I am loving their pieces, subtle but strong in their own way. That bedroom is definitely my favorite picture! I just happened upon your blog today and I think is is great...I love your selection of interiors and different home decorating tips, so happy I found the site. I hope you're having a wonderful week. Oh, I love this new direction. I'm particularly liking the houses pattern - very nice! I think I'm going to have to get my in-laws to send an M&S package to Australia! Wow! M&S really are sitting up and taking notice that we don't want the same old, smae old anymore! 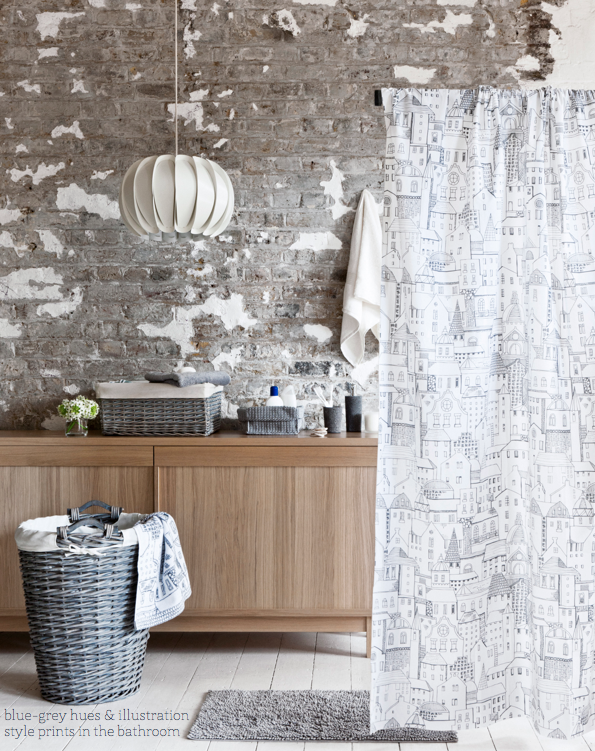 Love these new collections, especially the lampshade in the third photo and also the city scape fabric, reminds me of Paris! Oh My God!!! What are my eyes looking at?? I love all, just all... Why do I live in Italy??? I know... I can buy through the web ... Italy is wonderful...but I can't touch and choose these products with my hands...!!! Proving that once again, everything in the UK is cooler than the US, ha! :-) I need to move there! Seriously though, my husband and I are drooling over that clothes valet. It's almost too beautiful to hide with clothes! Thanks Will for a great post! This is just my cup of tea! But then the location really made the collection, didn't it? Oh My!! I want walls like the first cpuple pictures! What an amazing and edgy space!! Cute blog btw. I love the rug with the houses!